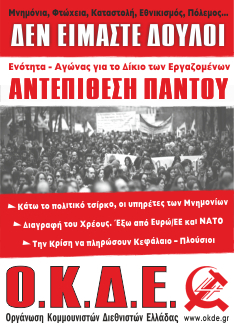 No to any “Agreement” with the EU–IMF Blackmailers. End the phony Negotiation, BREAK NOW with the EU and the Euro! VICTORY TO THE POLISH COALMINERS’ STRIKE! Not a single compromise with the EU’s, IMF’s and the Markets’ blackmails. Forward with Workers’ Struggles Everywhere! For a Program which can Solve our Problems!